Carrot Cake is a deliciously rich and moist Spice Cake that is full of grated carrot, chopped nuts, dried coconut, and crushed pineapple. I like to frost it with a tangy and sweet Cream Cheese Frosting. 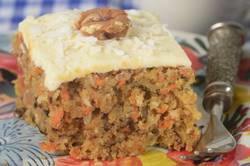 The interesting part is that while those pretty orange flecks of grated carrot give the Carrot Cake color and texture, along with sweetness and moisture, its flavor is almost indistinguishable. This Carrot Cake recipe is different than the other Carrot Cake recipe on the site, in that it contains buttermilk, uses a little less oil, and includes crushed pineapple and dried coconut. This recipe is from the San Francisco Baking Institute (SFBI). It was one of the cakes we made during a Five Day Cake Class. However, I did modify the recipe for the home kitchen. The time consuming part of making a Carrot Cake is getting all the ingredients together. First, the carrots need to be washed, peeled, and grated. You can use a box grater to shred the carrots or your food processor, if it has a shredding disc. For the chopped nuts, you can use either walnuts or pecans. For the dried coconut, I like to use unsweetened, either shredded or flaked. But you could use dried sweetened coconut. Crushed pineapple is added for both flavor and moisture and I do like to drain the pineapple before adding it to the batter. Applesauce could be used instead of crushed pineapple. And while you can buy commerical buttermilk, you can also make a good substitute. Stir 3/4 tablespoon of lemon juice or vinegar into 3/4 cup (180 ml) milk. Let stand for about 10 minutes at room temperature before using. Lastly, you could use this recipe to make a two layer cake. Bake in 2 - 8 inch (20 cm) round cake pans that have been buttered and lined with parchment paper. Bake in a 350 F (180 C) oven for about 35 minutes. Carrot Sheet Cake: Preheat your oven to 350 degrees F (180 degrees C) and place rack in center of oven. Butter (or spray with a non stick vegetable spray) a 9 x 13 inch (23 x 33 cm) cake pan and line the bottom of the pan with parchment paper. In a separate bowl, sift or whisk together the flour, baking soda, baking powder, salt, and ground cinnamon. In the bowl of an electric stand mixer, fitted with the paddle attachment (or with a hand mixer), place the eggs, sugar, oil, buttermilk, and vanilla extract. Beat, on low speed, until thoroughly combined. Gradually add the flour mixture and beat until incorporated and the batter is smooth. Scrape down the sides and bottom of the bowl as needed. With a rubber spatula or wooden spoon, fold in the chopped nuts, dried coconut, pineapple, and grated carrots. Spread the batter in the pan and bake for about 35 to 40 minutes or until a toothpick inserted into the center of the cake comes out clean. Remove from oven and let cool on a wire rack for about 10 to 15 minutes. Then invert the cake onto a wire rack, remove the pan and parchment paper. Re-invert so the top of the cake is facing up and let cool completely before frosting. Cream Cheese Frosting: In the bowl of an electric stand mixer, fitted with the paddle attachment (or with a hand mixer), beat the butter until smooth. Add the powdered sugar and beat until light and fluffy (about 2-3 minutes). Scrape down the sides and bottom of the bowl as needed. Add the vanilla extract and lemon juice and beat until incorporated. Add the very soft cream cheese in four to five additions (scraping the bowl after each addition), beating until incorporated and the frosting is nice and smooth. Place the cake on a cardboard cake board or your serving platter. Frost the top and sides of your cake. Can garnish the top of the cake with toasted nuts or dried coconut. The cake can be covered and stored in the refrigerator for about five days. Serve cold or bring to room temperature before serving. The cake can also be frozen for about one month. Defrost in the refrigerator overnight.